Mac and I went to see Spoon and Arcade Fire at Madison Sqaure Garden. 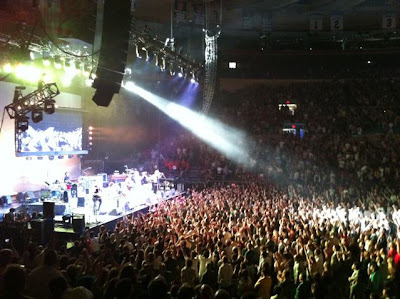 The crowd was nuts and sang along to every song, the band made MSG seem like a much smaller venue. My favorite part of the show was the lights and projected images. The album is called The Suburbs, so they had a giant billboard on stage with a highway overpass projected behind. On the screens were snippets of film that reminded you of the suburbs. They also had someone mixing live cameras and adding that to the mix on the screen. So sometimes you'd see a shot of the crowd blended with shots of the band, it was a cool effect.